The color of the car was different. The man on the pit box was different. But after that, things surrounding the No. 17 Roush Fenway Racing team of driver Matt Kenseth had a familiar look to them over the weekend. The kind of look they had back in the days when no list of top contenders to win Sprint Cup races and championships would be complete without the name of Kenseth. All weekend long at Las Vegas Motor Speedway and on the track on Sunday afternoon in particular, Kenseth and his team had the look of winners once again. When Kenseth got out of his car after the Shelby American late in the day, he said plenty with just three words. Kenseth finished fifth in the race. Not a place which would have felt good at all earlier in the decade when he was winning the 2003 series champion, when he was placing second in points in 2006, just 56 behind champion Jimmie Johnson. In those days, and quite probably even on Sunday at Vegas, fifth place would only feel OK.
What elevated the mood this time was how Kenseth got there from where he was just several months ago. Where he was, was searching. Yes, Kenseth had won the Daytona 500 last year, though in rain-altered fashion. And he did go on to make it two straight victories when he won at Auto Club Speedway the week after. But it was uneasy success and Kenseth knew the victories were not at all indicative of the health of his team. 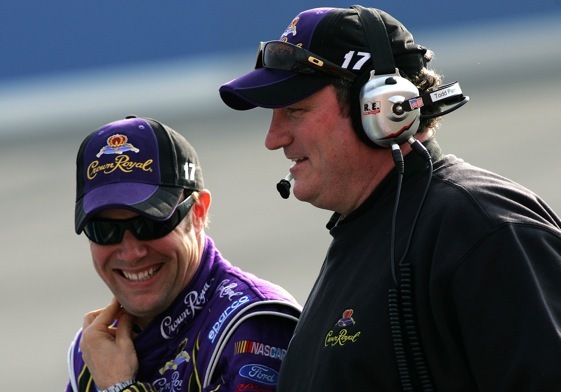 If he didn’t know that at Las Vegas in 2009, he sure knew it when, for the first time, he missed the Chase for the Sprint Cup Championship and wound up 14th in points. Kenseth and owner Jack Roush spent the off season pondering the status of the No. 17 team. Pondering the status of crew chief Drew Blickensderfer, who had taken over the job for the 2009 season. Kenseth said the decision was made to start the season with Blickensderfer on the box. “I wanted to make sure he had all winter and really had a chance to make the team his own and lead the team,” Kenseth said. Kenseth finished eighth in the race at Daytona, but things still just did not feel right. A couple days later, Roush announced that Blickensderfer would be removed from Kenseth’s pit box. Veteran Todd Parrott took Blickensderfer’s place the following week at Auto Club Speedway. Kenseth finished seventh. And then came the fifth-place finish at Vegas. Not better in terms of what Roush called “arithmetic”, but better in terms of “chemistry”. “I can see a difference and it’s interesting because Todd has been around for a long time and he’s obviously won a lot of races and a championship (with Dale Jarrett in 1999),” Kenseth said. “I know the last couple of programs probably didn’t go the way he hoped, and I’m pleasantly surprised by his excitement level and his enthusiasm, and how excited he is to come back and have another shot at being in a competitive program and winning races and trying to run for a championship. In the race, Kenseth’s Ford Fusion appeared fast enough to win. He passed cars, he got it to the front and he led for nine laps. And, perhaps best of all, he had what teammate Carl Edwards would call “a blast”. “In the beginning we ran up there,” Kenseth said. “Carl and Greg (Biffle, a third teammate) and myself were all up there and it felt like a few years ago, so it seemed like all the cars had a lot more speed this weekend. The kind of day he and his team had regularly back in the day.